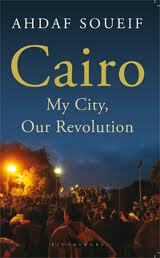 Everything about Cairo: My City, Our Revolution shows that it was a book Ahdaf Soueif felt compelled to write. Partly a chronicle of the 18 days in 2011 that changed the course of modern Egyptian history, partly a memoir of Soueif’s life in and love for Cairo, the book is emotional, affecting, polemical, and necessarily imperfect–because, as Soeuif is very aware, the story it tells wasn’t over when she wrote it and (as she often remarks) will have developed even further by the time it reaches its readers. So why write it and publish it now, instead of waiting until we know more about what came after those 18 days? One obvious response would that it will almost certainly be years, not months, before we’ll know how things turn out–as if, of course, there ever can be a definitive or complete story of any event. Defining beginnings and endings is always to some extent arbitrary. What Soueif has done, then, is not to offer (and not to pretend to offer) a ‘history’ of the Revolution, but to give an account of a specific moment that actually, by historiographical standards, does have remarkably clear boundaries. On January 25, 2011, protesters marched to Tahrir Square demanding the fall of the Mubarak regime; on February 11, 2011, Mubarak stepped down. From the distance of one year, perhaps that has come to seem like not much, like not enough; the regime fell but what has replaced it? On February 11, 2011, though, Mubarak’s resignation was more than most had ever imagined. It wasn’t (isn’t) everything, but without it, there could have been nothing further. So there’s an intrinsic rationale to telling that story, to giving us one insider’s view, one participant’s experience. Even the light in here is different, the feel of the air. It’s a cleaner world. Everything’s sharper, you can see the leaves on the trees. Badly lopped, they’re trying to grow out. Everyone is suddenly, miraculously, completely themselves. Everyone understands. We’re all very gentle with each other. As though we’re convalescing, dragged back from death’s very door. Our selves are in our hands, precious, newly recovered, perhaps fragile; we know we must be careful of our own and of each other’s. The Midan is sparkling clean. The rubbish is piled neatly on the periphery with notices on it saying ‘NDP Headquarters.’ . . . Lamp posts have put out wires so that laptops and mobiles can be charged. The field hospitals provide free medical care and advice for everyone. A placard reading ‘Barber of the Revolution’ guides you to a free shave and a haircut. A giant transparent wall of plastic pockets has gone up. The shabab [youth] sit next to it. People tell them jokes and they draw or write them and slot them into the pockets; a rising tide of jokes and cartoons. A Punch and Judy show is surrounded by laughing families. A man eats fire. There’s face-painting and music and street theatre and a poetry stand. We watched the old torturer, stiff with formality and self-belief, clinging on to his simple conspiratorial concepts, holding himself rigid against the tide, his thumbscrews and cattle prods for the moment useless. When he says his message to us is: ‘Go home. We want to have a normal life,’ the streets answer with one voice: ‘Mesh hanemshi / Enta temshi!’ We’re not going / You go home! And then, in the Midan, there was a wedding, and then more music and everywhere there are circles of people sitting on the ground talking, discussing; ideas flowing, from one group to another until the most popular find their way to one of the four microphones on the stages. I pause by one group and they immediately invite me to sit. People introduce themselves before they speak. Three civil servants, a teacher, a house painter, two women who work in retail. They talk about what brought them to Tahrir. In the end, the house painter says, it comes down to one thing: a person needs freedom. As a document about that moment in time, then, Cairo: My City, Our Revolution is compelling. A second rationale for the book, though, is that Soueif also explicitly considers it a contribution to the larger struggle begun on January 25, 2011 but nowhere near finished when the book went to press, and certainly not finished today either. 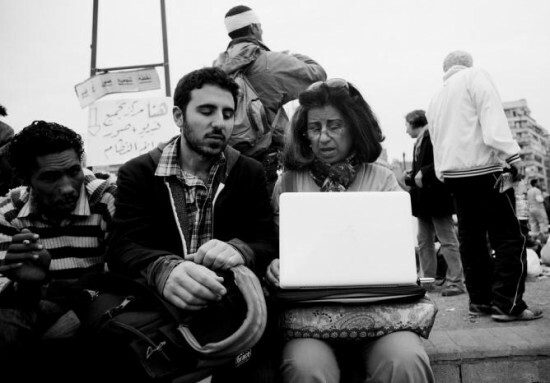 Soueif’s account of the 18 days is offered in two parts that sandwich a third section called simply ‘An Interruption.’ Here, from the vantage point of October 2011, Soueif records and reflects on some of the events after the protestors left Tahrir: “On February 11 it seemed that we had emerged into a clear open space and that our progress would be swift. Now, eight months later, our landscape is more ambiguous, more confused.” Egypt has not been transformed: “SCAF have allowed no one to examine, punish, rehabilitate the security establishment, so the country is full of armed and disgruntled police and baltagis [enforcers], short of cash and ready to be used. The regime is still rich. And the old alliance between the regime and the security establishment is still in place.” The army that refused to fire on its own people now hinders the revolution at every turn; the generals rule nearly as despotically as Mubarak, and the result is “a story of escalating confrontation between the revolutionaries and SCAF.” Protests are violently broken up, people are beaten and jailed, different elements exert their influence–“I see the Saudi flag flying in Midan el-Tahrir.” The organic community of those 18 days has been dispersed. if people had not been optimistic on 25 January, and all the days that followed, they would not have left their homes or put their wonderful, strong, vulnerable human bodies on the streets. Our revolution would not have happened. the capital of an Egypt that’s come back to her people, that’s regained control of her land, her resources, and her destiny, and Egypt that is part of a world on its way to finding a better, more equitable, more sustainable way of life for its citizens,where people’s dreams and ambitions and inventiveness and imagination find an open horizon, and where variety and difference are recognized as assets in confident, vibrant, outward-looking communities. That by desiring what is perfectly good, even when we don’t quite know what it is and cannot do what we would, we are part of the divine power against evil–widening the skirts of light and making the struggle with darkness narrower. Soueif is deeply (understandably) troubled by her sense that Mubarak’s fall unleashed “the Forces of Darkness” encased and organized by his regime: “Now the casing’s been smashed and the Darkness is out there, unchannelled, panicked, rampant, twisting into every nook and cranny as it seeks to wrap around us again.” A book, however eloquent, may not be much, against such forces. But her hope is clearly that it will help keep the light of the Revolution bright and, indeed, make “the struggle with darkness narrower.” “This is about a better way of being in the world,” she says in the interview I’ve linked to above. That seems well worth hoping for. As always, Rohan, thank you for this wonderful post. Couldn’t believe it when I got to the Middlemarch quote–the passage in my old volume that has the most stars and sticky notes. Just occurred to me, on this reading, that the “widening the skirts” makes this activity particularly feminine. It is indeed a struggle to maintain optimism–but useful (and inspirational) to think of it as a moral duty. Also a struggle to just mark one phase of success before losing oneself in all the potential darkness and complications that lie ahead–but perhaps also a moral duty. A lot to think about, and I am grateful to you for this. I thought of you as I was writing this post, Susan; I’m glad you liked it. The book isn’t released yet in NA but I ordered it in from the UK because I was impatient to read it. I love that passage in Middlemarch too.